I have a wooden bowl I use to hold potatoes, onions and garlic. It sits at the end of my kitchen counter and normally does a very good job of keeping the root vegetables dry and firm. 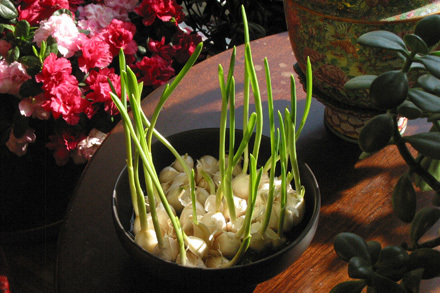 Perhaps because of the warm weather of late some of the garlic bulbs started sending out green shoots. I decided to put the bulbs in a small shallow bowl with water, and placed it in front of a very sunny window in the living room. I am in fact very proud of how the shoots are beginning to grow into beautiful greens.